New Citroën Dispatch is set to become the ideal partner for UK professionals, with enhanced practicality, comfort and safety stemming from new design features, architecture and technologies. The global public reveal of New Citroën Dispatch will take place at 9.15am on the Citroën stand (Stand No. D40/Hall 5) at the CV Show in Birmingham on Tuesday 26 April. Citroën is to launch a new generation of the ever popular Dispatch LCV, featuring new technologies, design features and architecture, as well as functions that are new to the segment. New Citroën Dispatch is the first vehicle of its type to offer hands-free sliding side doors and a head-up display, as well as numerous other technologies that make working lives easier and safer. 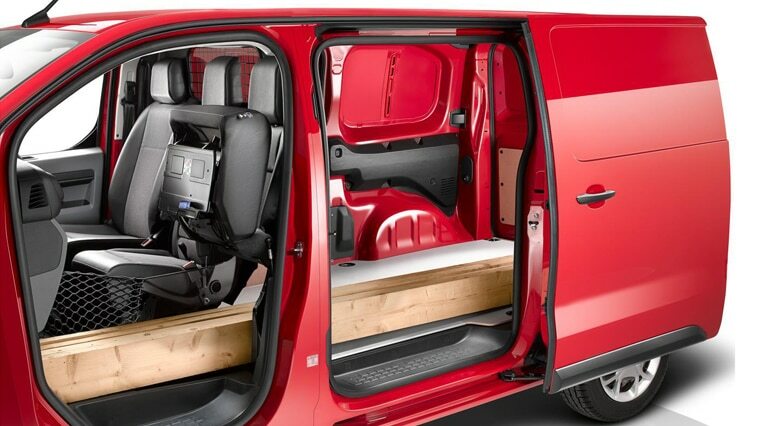 Designed with a wide range of professionals in mind (including tradespeople, construction workers, local authority employees and delivery and service professionals), the new vehicle will be available in van, Combi and Crew Vanversions, as well as being specified in three lengths (XS: 4.60m, M: 4.95m and XL: 5.30m). Further to the hands-free sliding doors and the colour head-up display, new features include Driver Attention Alert, Active Safety Brake, Citroën Connect Nav and Mirror Link systems, and a wide range of optional extras to suit every professional’s unique needs. New Citroën Dispatch is built on a latest-generation modular platform (based the EMP2 platform), which has been designed specifically for the new model. The platform has a reinforced structure with special new front and rear axles. It supports a payload of up to 1,400kg and can tow up to 2.5 tonnes. Launched in 1995, the original Citroën Dispatch sold 600,000 units. New Dispatch joins the Nemo, Berlingo and Relay as part of Citroën’s broad modern range of LCVs. • A flowing and modern design with characterful styling. • An efficient, adaptable architecture that delivers greater functionality, practicality and user-friendly features. Based on the EMP2 modular platform, it offers up to 1,400kg of payload capacity, 6.6m3 of load volume and can tow up to 2,500kg. • Three lengths, including an all-new version at just 4.60m as well as the core market 4.95m and 5.30m versions. As with the two longer lengths (M and XL), the XS version also has a payload of up to 1,400kg and, in Combi form, can transport up to nine people. • A height of just 1.90m for the XS and M versions, making for easy underground car park access, which is unusual in the segment and a rarity amongst competitor vehicles. • Unrivalled modularity in the segment with the Moduwork feature. The side passenger seat can be lifted to provide extra space with a flat floor and a large flap in the bulkhead, offering a useful length of up to 4m. • Hands-free sliding side doors. New to the segment, these automated doors make loading and unloading easier when the driver's hands are full. • A welcoming interior, a high-set driving position and a host of storage compartments for improved physical and mental well-being. Comfort is heightened through top-flight acoustic treatment and an optimised ride. • Technologies that make life easier including Park Assist 180°, colour head-up display and Citroën Connect Nav with voice-operated connected 3D navigation and a touchscreen. The New Dispatch's adjustable writing panel and tablet, and smartphone compatibility turn it into a real mobile office. Enhanced safety through technology including adaptive cruise control and speed limiter, road sign recognition, Driver Attention Alert and Active Safety Brake. • Best-in-class fuel consumption and CO2 emissions (BlueHDi 115 S&S 6-speed manual: 55.4mpg and 133g/km ofCO2) and controlled running costs thanks to latest-generation 1.6-litre and 2-litre diesel engines ranging from 95hp (210Nm) with a manual gearbox to 180hp (400Nm) with an EAT6 automatic gearbox.